Esteban, an enslaved North African, made the first contact with the native peoples of what is now the American Southwest. Fraught with misunderstandings, that encounter led to Esteban’s untimely demise in 1539 and prefigured the violence that would characterize the Spanish conquest and subsequent colonization of the region. Esteban’s experience as a survivor of the failed Pánfilo de Narváez expedition to Florida in 1528 made him a natural choice to lead an exploration into the fabled lands of the north in what is now northern Mexico as well as Arizona and New Mexico. Fleeing from fierce attacks launched by the Apalachee, Esteban and his master, Captain Andrés de Dorantes, along with Alvar Núñez Cabeza de Vaca and thirteen others, sailed west through the Gulf of Mexico on quickly-constructed barges. They landed on a sandbar off Galveston Island (Texas) where Karankawa Indians enslaved the explorers, four of whom survived and managed to escape five years later, in 1534. In 1536, the survivors and their retinue of six hundred Indian escorts came across a Spanish slaving expedition, a chance meeting that ended their eight-year-long, 15,000-mile sojourn. The seemingly miraculous return of the intrepid survivors turned the attention of Spanish colonial administrators in Mexico City toward the mysterious north which had long been rumored to harbor a treasure to rival that of the Aztecs. 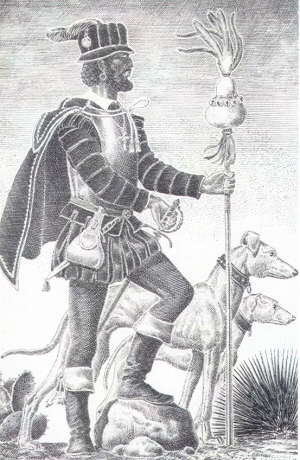 When the three European survivors refused to lead an expedition to the north, Don Antonio de Mendoza, the Viceroy of New Spain, engaged the services of Esteban, purchasing him from Dorantes. Protocol demanded, however, that a slave could not lead an expedition. Hence, Mendoza persuaded a Franciscan friar, Marcos de Niza, to at least nominally head the venture. The group set out in 1539. By prior agreement, Esteban traveled several days ahead of Fray Marcos, leaving behind him a trail of crosses of varying size, corresponding with his findings. Esteban returned to his previous roles as healer, interpreter, go-between, and “son of the Sun.” Convinced of Esteban’s healing powers, some 300 natives joined his retinue and provided him with numerous presents. All went well until he reached Hawikuh, a Zuni pueblo located just east of the present Arizona-New Mexico border. He sent a message ahead, stating that “he was coming to establish peace and heal them.” Pueblo elders responded with a warning: he must not enter the village. To his detriment, Esteban ignored the warning. Word of his death reached Fray Marcos, who gazed at Hawikuh from afar, then headed back to Mexico City, claiming to have discovered the fabled golden city of Cibola. Though they took Esteban’s life, the Zunis memorialized him in a black ogre kachina named Chakwaina. To the Native people, Esteban was the harbinger of the European conquest to come. More important, however, he found a niche as a cultural broker, paving the way for intercultural communications among peoples of Europe, America, and Africa. As an enslaved North African man (native of Azamor, Morocco), living first in Spain, and then in Cuba and later in Mexico, Esteban spent his lifetime moving among various peoples and cultures. His own survival depended on his ability to function in multiple worlds. George P. Hammond and Agapito Rey, eds. Narratives of the Coronado Expedition , 1540-1542 (1940). Dedra S. McDonald, “Intimacy and Empire: Indian-African Interaction in Spanish Colonial New Mexico, 1500-1800” in James F. Brooks, ed., Confounding the Color Line: The Indian-Black Experience in North America (2002).